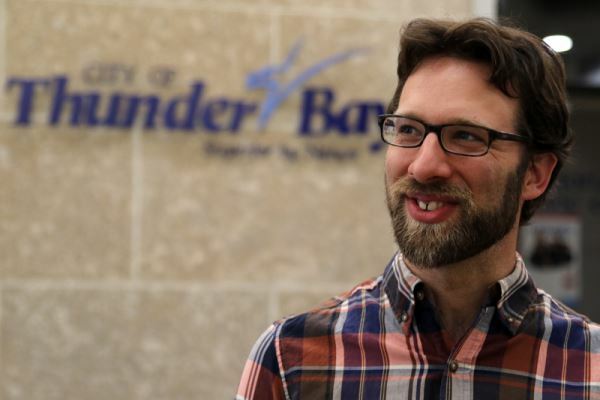 THUNDER BAY – City administration will propose the intersection at Algoma Street and Cornwall Avenue as the spot for the first pedestrian crossover. The intersection where a traffic light once stood was chosen as the crossover pilot site over 36 other locations across the city, which were whittled down to a shortlist of seven priorities including Simpson Street, Arundel Street, High Street. City mobility coordinator Adam Krupper said the engineering department considered traffic and pedestrian volume, collision history, surrounding infrastructure and the length of time needed for pedestrians to cross in making the decision. “The intersection of Algoma Street and Cornwall Avenue the only site from the short list that met both the pedestrian and vehicular traffic volumes that warrant a pedestrian crossover,” Krupper said. If city council approves the recommendation at its Aug. 22 meeting, $35,000 in signage and infrastructure will be constructed around the intersection in September. Krupper pointed out re-installing a traffic light would cost five times more. “We’re going to see, as we approach, a ‘crossover ahead’ sign. The next thing we’re going to see is a ‘no passing here’ sign,” Krupper said. “Then overhead, we’re going to see a big white sign with a picture of a person crossing the road. Then there’s going to be another sign closer to the pedestrian level that shows a person crossing and there’s going to be a yellow flashing beacon. Krupper added pedestrians would be expected to make eye contact with motorists, who will stop on white triangles painted on the street known as shark teeth. Changes to provincial regulations in 2015 calls for crossovers to be erected no closer than 200 metres from the nearest traffic light and the local pilot will be 211 metres from the intersection at Bay and Algoma streets. Although the city intends to monitor the site, Krupper is confident the crossover won’t back up traffic. “People are already crossing that road at random locations and every time a person crosses that road at a random location, traffic gets blocked up,” he said. Engineers considered collision records between 2005 and 2015, a time period that showed zero collisions on High Street but ended before a woman and her dog were struck crossing the street in March. The incident led to a movement calling for the pilot to be placed on High and Bay streets. Krupper said while the High Street intersection with Bay Street has both the pedestrian and traffic necessary to be a crossover location, it also has infrastructure shortages the city can’t afford to address. “The challenge with that location is, each of these crossings has to be fully accessible.